> I won’t deny that part of the reason to operate this blog is to promote my own work. (The larger part of the reason, I suppose, is to promote literature in general, including emerging writers who otherwise get little exposure.) 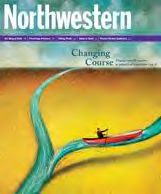 So I shouldn’t feel uncomfortable about the article (“Changing Course“) in the Northwestern University Alumni Magazine in which the subject of career changes is discussed by author Elizabeth Canning Blackwell, beginning with me. I shouldn’t, but I do. Blackwell does a nice job with the piece, though, and I’m pleased with the way it turned out. I changed careers a few years ago — I went back to graduate school to get a master’s in counseling after working several years in the registrar’s office at IU. Lots of my friends and co-workers said, “I wish I could do something like that.” I’m glad I took the plunge, although I’m not practicing now. And I’m so happy to read about someone who has more master’s degrees than I do (2). >Change is good! Or something like that. IU, huh? I read about your Indiana roots on your blog . . .
>If you were at IU between 1985 and 1999, I probably had something to do with your student record. >No. I was there 1978-81. I probably requested transcripts at some point during your tenure, though! >I, for one, am very glad you made the leap!